The browser controls and way to sensative ATM. Race against the clock to get the pallets stored and ship them out. This is my COMPO entry for the Ludum Dare #42. Tracks player high score! 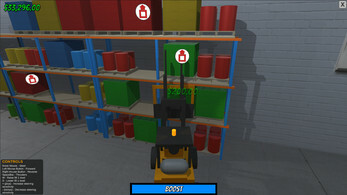 In this game, you operate a forklift and race against the clock to store pallets that come in from Receiving and grab pallets off the shelves to send out through shipping. 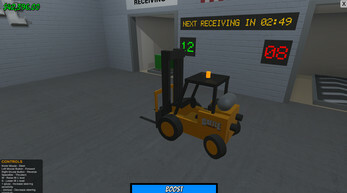 If the Receiving counter reaches 20, you are fired and you lose the game. If the Shipping counter reaches 10, same result. Time is money so no messin' around! 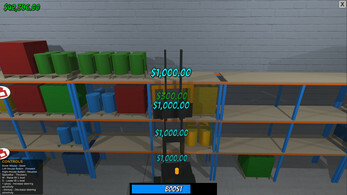 Enter the Receiving bay to grab a pallet and then place it on a shelf anywhere you like. When the receiving counter reaches zero, you will get $1,000 for every second left on the timer. 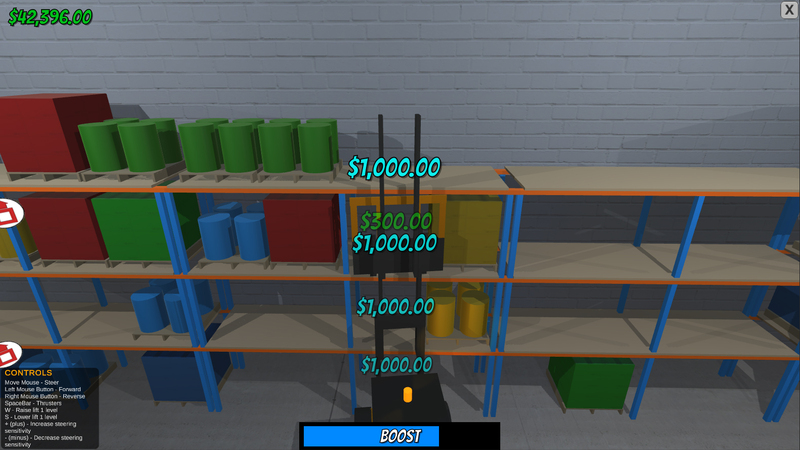 Match any 4 (four) same colored pallet either horizontally or vertically and gain a $10,000 bonus for each pallet matched. They will also be removed from the shelf. Pallets to be shipped will be marked. Grab them from the shelf and take them to the Shipping bay when the red shipping marker appears over them. 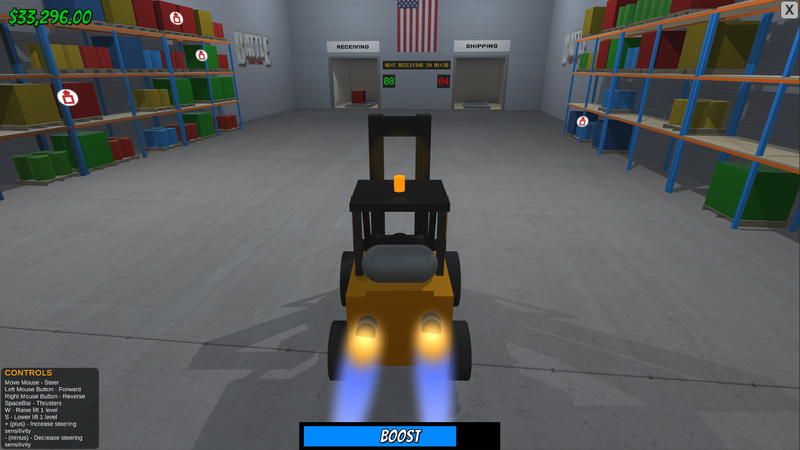 To operate the forklift, use the mouse to steer, the left mouse button to go forward and the right mouse button to reverse. 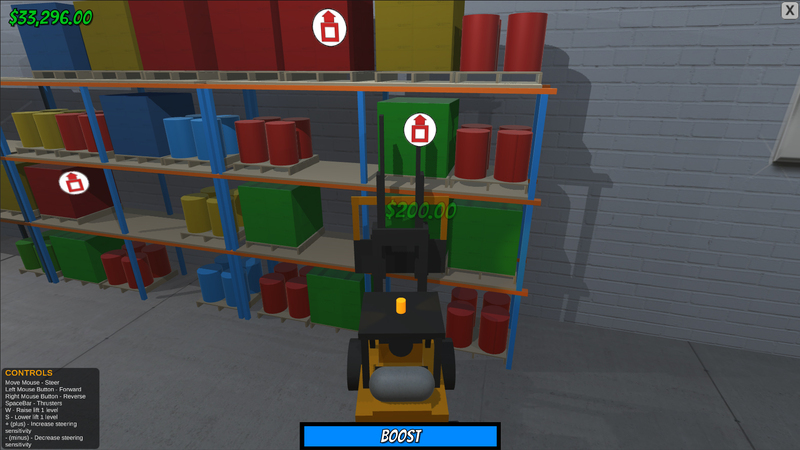 Press the 'W' and the 'S' keys to raise and lower the lift respectively per shelving level. Press and hold the 'Spacebar' to activate the thrusters to gain a movement bonus. Use it sparingly as you only get so much per receiving cycle. When more receiving comes in, the fuel is replenished. All the objects are made from Unity primitives such as Cubes, Capsules, Spheres and Cylinders. The textures were made in Photoshop with the help of a few tutorials and the nVidia Normalmap Filter (not much of an artist). The sounds were recorded using my voice and pitched, filtered and amplified with Audacity. The music was made with a music creator called Bosca Ceoil.